Server Labs: How can I delete the Snapshots in the VM workstation? How can I delete the Snapshots in the VM workstation? Snapshots are the copy of the virtual machine on a particular stage that is specified by administrator. It.It It is a copy of the virtual machine's disk file (VMDK) at a given point in time. Snapshots provide a change log for the virtual disk and are used to restore a VM to a particular point in time when a failure or system error occurs. Snapshots alone do not provide backup. Form the version of VM 5 we can be used with multiple snapshots for the single VM workstation. 1. As first initiative you must select the virtual machine whose snapshot need to be deleted. Go to the tab VM ->Snapshot->Snapshot manager. 2. The same will get you to the snap shot manager where you will be listed out with all the snapshots that are available for particular VMs. 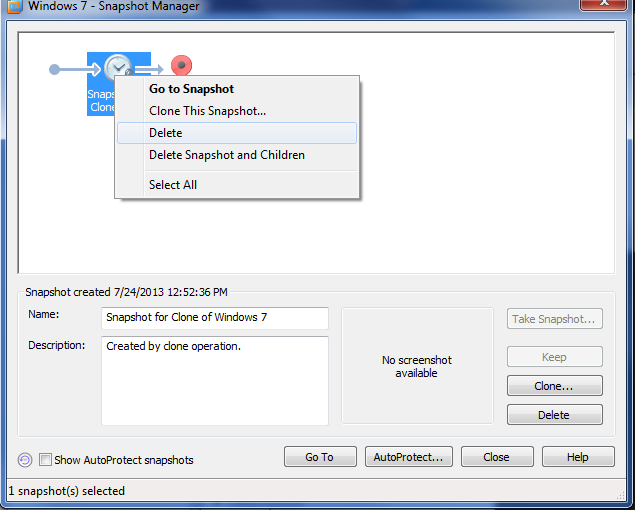 Right click on the snapshot that you need to delete and select the option ‘delete’ to delete the particular snapshot. Note: Remember that you cannot delete the snapshot which is currently active, if you need to do so revert the virtual machine to another snapshot and try deleting the snapshot. Now press ‘Yes’ will give you the below screen as the progress of deletion. Please wait until it completes and the window will vanish. 4. Now if you look at the ‘Screenshot manager’ you can identify that the selected snapshot has deleted and the machine is working with the present snapshot.